This French Country Travel Life Bread Update will not change your life. Will not make you thinner and/or more attractive. However, it may add a few interesting factoids not convered in my previous French Bread Post. After all, I would not be DA BG, if I didn’t keep you current – would I? As you know, the currency of record here in Western Europe is the EURO. Always worth more than the U.S. dollar. (sometimes not by much) Before the “big E” arrived on the scene, France had a currency cleverly named “the franc.” Then the price of bread was around 2 francs to 2.50. When the Euro replaced the franc, One euro was equivelant to 6.5 francs! Happy days for bakers! But not for bread buyers. 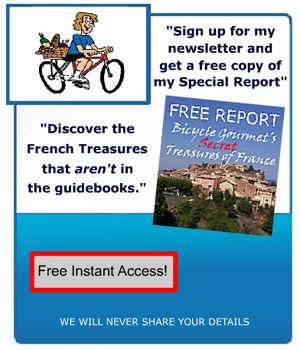 Now you have a deeper understanding of why the French are not in love with the Euro. The last time a French Government pulled a fast one like this – it created a social protest know as The French Revolution. Yes, dear reader, it was all about bread! The common folks had none. The rich folks had it all. Enter Robespierre and the gang. In 1788 and 1789, speculation in the movement, storage and sale of grains combined with adverse weather conditions led to a severe bread shortage throughout France. Prices for this staple increased beyond affordability, especially for the poor and peasant classes. While the rich had plenty of fine bread made from pure white flour, the poor either starved or subsisted on an inferior product made from poorly milled bran grains. Mass starvation eventually provoked revolution. 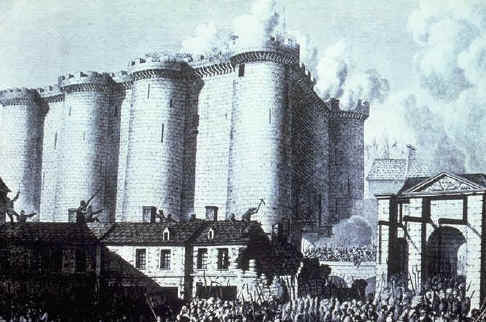 The storming of the Bastille was more a call for bread than it was an uprising to free enemies of the crown. The people cried out for bread and searched the bakeries to no avail. There was no bread. Once calm was restored, the constituent assembly authorized bakers to make only one kind of bread – “bread of equality ” (pain d’ egalite) – made from flour that was ¾ wheat and ¼ rye with the bran included. White flours were banned and rationing was introduced. The victory of the republic and the abolition of feudal priviledges did permit the return of white breads to the table. It eventually became the everyday bread. After Napoleon seized power, he was determined not to make the same mistakes made by his predecessors. His government issued decrees that established standards for French bread, specifying ingredients and baking methods. These Napoleonic decrees also elevated the status of professional bakers; establishing quality control for flour milling, mixing, and dough kneading; and ended the speculation in grains by farmers and commodity brokers. Later, governments added to the Napoleonic decrees, specifying ways to knead and aerate the dough and establishing shape and size criteria for any loaf designated an authentic French baguette. bread – the reason for the french revolution! news to me! me too!…can always count on DA BG to bring us up to speed..yeah? fascinating stuff….a real eye opener! only DA BG could make bread and revolutions interesting! great intro imlage for a great post…revolutionary, to say the least! i’m sure someone else has already commented on the opening picture….but to me…it conveys all the essence and romance of france. nice post too! learning french history would be no fun without your fantastic take on it all. you’re my fav teacher! each time i read you…i find something new about something i thought i knew. truly the mark of an excellent blogger. grazie BG! easy to understand the french distase for the euro. who would like to see the price of bread tripled overnight? marion…no one except politicans and bakers!